XPERIENCED AND DEDICATED TEAM: We are more than just colleagues after working together for over a decade; we are more like a family profoundly united by our passion for travel, and our willingness to contribute to the sustainable development of Mongolian tourism. Further, we train our tour guides and drivers regularly so that all are on the same understanding of who we are and what we do as a team. We are proud that our tour guides are more than just names and dates; they strive to offer a deep insight into Mongolia’s nature, culture and people. XPERTS IN TAILOR MAKING TOURS & RELIABLE COMMUNICATION: At Premium Travel we take pride in our proficiency in designing and tailor-making tour experiences for everyone who is willing to feel Mongolia at its’ best. You will see it from the very moment you contact us till your departure after having a wonderful time in Mongolia with us. It begins with a correspondence between a devoted travel expert and avid travellers, which usually ends in a life-long friendship; we have many good friends all around the world. Come and experience the real nomadic culture, enjoy the pristine nature. USTAINABLE TOURISM COMMITMENTS: At Premium Travel we are conscious that tourism really is based on a solid harmony of people and the Mother Nature – you can’t imagine visiting Mongolia without meeting the hearty Mongol nomads and going to the wilderness of the countryside. Therefore, to contribute to the sustainable development of Mongolian tourism, we aim to educate our tour staff and the local communities we visit on the importance of nature and cultural conservation, and reflect “light footprint principles” into our tour operations. 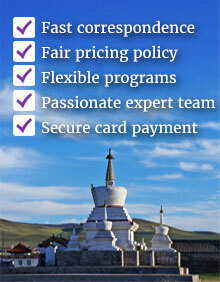 RAVEL IN STYLE WITH US:We’d love you to experience and appreciate Mongolia the way it is. And as your local travel experts will ensure that your travel with us will be a truly authentic and a lifetime experience. We are proud and passionate about sharing our extensive knowledge of our beautiful country with you. Despite the fact that tourism infrastructure is still developing in Mongolia, we do our utmost to offer you wonderful experiences and carefully hand pick the best possible beds & services at each destination you travel with Premium Travel. We prepare any tour experience as if we’d do it for our beloved. Travel gives you more reasons to enjoy life!